Grains trading lower this morning with corn down 3 cents and beans 9 cents lower. For the week, corn is down roughly 17 cents and soybeans are down 50 cents. The soybean market is still trying to absorb the large numbers from the USDA report yesterday and are leading the commodity space lower this morning. The Midwest weather forecast remains favorable for crop development with decreasing temps and rains moving through most of the corn belt the next few days. 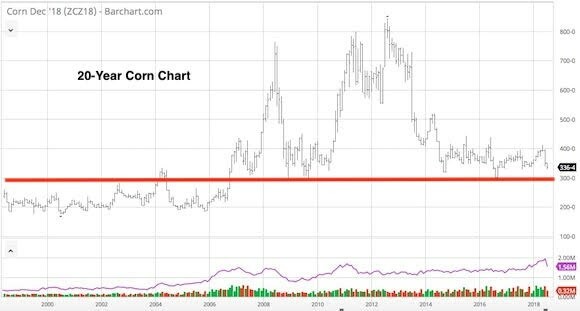 Technicals: 20-Year Corn Chart… As you can see we are approaching major support around the $3.00 area. We haven't traded sub-$3.00 since December 2008, when the markets traded to a low of $2.90 per bushel.